While SUMMING data is probably the most common task in Excel, I am surprised that many people are not aware of this Excel feature – AutoSum. It is super handy especially when you know the shortcut of it, which is ALT+=. Tip: When you make the selection, make sure you have selected an “extra” row and/or column to reside the total(s). Flash Fill was introduced in Excel 2013. After 6 years, it is still a hidden gem of modern Excel that most regular Excel users do not even know its existence. Whenever I show to my colleagues what Flash Fill is capable of, they are all impressed and think that this is their “Greatest Discovery” moment. So in this post, I am going to show you in a flash what Flash Fill can do with 16 examples. Note: CTRL+E is the keyboard shortcut for Flash Fill which had been used in all the GIFs in the coming demonstration. Long time ago, I wrote a blog post How much do I need to pay? which was not really related to Excel but calculation of a random daily event. Similar to that old story, a friend asked me for an Excel solution for a different scenario, which I think is quite interesting and really need Excel to do the calculation. Long story short – when we have more than one birthday stars in a party, maybe a birthday star should treat other birthday star(s) as well. Thus, s/he will need to pay a share. WOW… it sounds like an Excel challenge that I really like to take. In the previous blog post, we see how Flash Fill extracts First Name and Last Name from an email address in a format shown above. I’ve also recorded a video for that post. Flash Fill is so smart to detect the pattern of CamalCase and return the desired result in a flash. However, if you are still using Excel 2010 or before, it is NO EASY TASK and required advanced skills in formula writing. The key challenge is to identify the position of the second CAPITAL letter in the text string. Once we have identified the position of it, getting the First Name and Last Name is totally manageable. Without a single input in formula bar. UI only. No kidding! What’s even more unbelievable? The above can be done in just a couple of minutes. The technique discussed in this blog post is applicable to Excel 2016 or later. And the techniques used are mainly Flash Fill and Quick Analysis, which are available since Excel 2013. But why I said it’s applicable to Excel 2016 or later? Because the chart types Histogram and Pareto were introduced in Excel 2016. I am not saying that we cannot perform the above transformation using Excel 2013/2010. It’s just a matter of time + higher skill level is required. Honestly it takes much more time and effort than writing a blogpost. 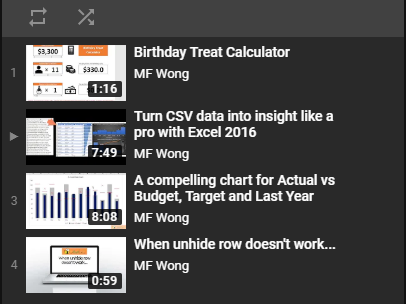 After making just two videos, I can imagine the GREAT efforts all other Excel geniuses like ExcelIsFun, MrExcel.com, Leila Gharani, Excel On Fire (just to name a few) they have put on their channels, where you will find a lot of great Excel videos. Really appreciate their efforts! 👍 Indeed they have inspired me a lot through my Excel journey. I am not dreaming about my channel will become as popular as theirs. Though I do hope, my channel will get more popularity from time to time, especially in the Cantonese-speaking communities. My goal is to produce one to two videos per month. Should you have any comments/suggestions, please leave your comments. Last but not least, if you like my video, please SUBSCRIBE my channel. please continue to read this post. In business world, we often compare actual sales to various benchmarks such as budget, target, and last year. In this post, I am going to show you step-by-step how to make a compelling chart for this purpose. This is basically a simplified version of bullet chart, and is super-easy to create. I hope you find it useful and relevant. Kung Hey Fat Choi! This week is Chinese New Year. I wish you a fruitful, healthy, and rewarding Year of Pig! I have almost one week off for CNY holiday. I have cleaned my PC and spared 50G+ space in the hard drive; got a new fantastic video production and editing tool; and more importantly produced my first Excel video and posted it on YouTube. Chinese New Year is coming really soon. 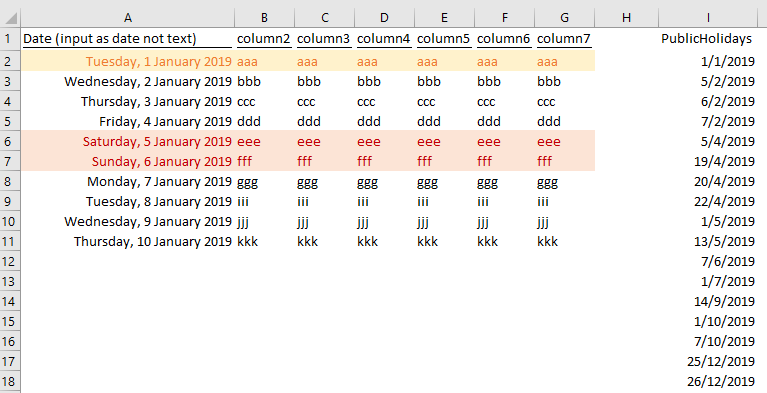 Let’s talk about something about “New” in Excel in this post… but don’t make me wrong, I am not talking about any new features in Excel 2016/2019/365. Indeed, what I am going to discuss about is a feature that exists for a long long time, but not many people are using it (at least not to the people I work with). Interestingly, this “New” stuff is very common and I believe all Excel users have used it at the most fundamental way. Let’s look back at the sample we used in the previous two blog posts. In the following screen shot, you see that the formula used refers to a “fixed” range of $I$2:$I$9. It works totally fine given the current static situation. But what if we are moving into May and are ready to input more “PublicHolidays” to the list? Oh no… it didn’t work as the formula was hard-coded. That’s why we want to make the formula used in Conditional Formatting be dynamic! It is not uncommon to work with dates in Excel. Be it a Gantt chart for project management, a roster, or simply a calendar, we would like Excel to highlight non-working dates. One of the most common tasks should be highlighting weekends and public holidays. It could be a tedious manual task when you need to maintain it on monthly basis. The good news is this tedious, boring task can be done by conditional formatting with ease. Happy New Year! Wish you all an Excel-lent year of 2019! As an Excel nerd, I’d like to spend my holidays on learning Excel… haha… I know I am abnormal. 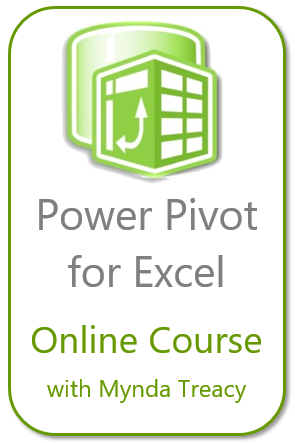 ;p My recent love of Excel is Power Query (M) and Power Pivot (DAX). As their names say, they add POWER to Excel. Bear in mind that, this is only the beginning. You will still need to study and practice, again and again, to become a true master of Power Query which is my new year resolution. 🙂 Let’s work hard toward this! If you are using Excel 2016 or Office 365, Power Query is already loaded. It is under “Data” tab and renamed as Get and Transform. a dropdown menu to make the Top X a dynamic one? So why don’t reference the (Top) X to a cell, say G2, where a user can input directly?